(L-R) IAMURE Journal Editor-Dr. Ethelbert Dapiton, Prof. Norqueen Dumadaug (WMSU Faculty), Dr. Manuel Bajet (Vigan participant) and Michael Vincent Caceres (ZSCMST faculty). 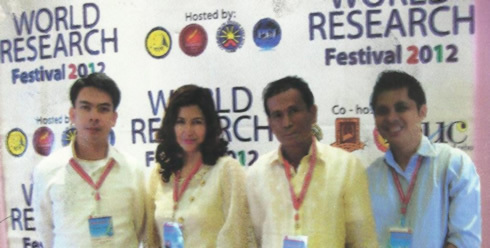 Prof. Norqueen T. Dumadaug of the Western Mindanao State University (WMSU) College of Home Economics (CHE)-Food Technology Department participated in the World Research Festival 2012. The said prestigious research event was held at the Marco Polo Plaza, Cebu City last August 22-25. WMSU CHE Food Technology Department Head-Prof. Dumadaug with her research presentation titled, Eucheuma Pulp Extracts: Source of Nata and Nata Producing Organisms, together with Michael Vincent P. Caceres from Zamboanga State College of Marine Sciences and Technology (ZSCMST) with the presentation, Faces/Spaces of Penology: Lessons from Tradition to Transformation. The Zamboanga contingent to the event was accorded with Platinum Awards for their oral presentation of their researches. The affair’s theme is “Research that Changed the World”, the event aimed to provide a forum for professional and student researchers across the world as means for dissemination and utilization of high-impact researches; nourish collaboration among researchers and institutions in promotion and production of researches; recognize meritorious contributions of world researches and institutions; and promote quality research publications as credible source of scientific literature. Participating countries to this year’s festival were Australia, Canada, Indonesia, Iran, Jordan, Malaysia, Nigeria, Norway, Pakistan, United Kingdom, United States of America and the Philippines. Furthermore, the conference streams of the event encompassed areas of institutional research; biodiversity and conservation; business, economics, and public governance; education, behavioral and social sciences; health and environment; languages and literature; math, science and engineering; philosophy and religion; and inventions.